Nestled on a quiet tree-lined street, just five blocks from the sand, discover this turn-key beach house. 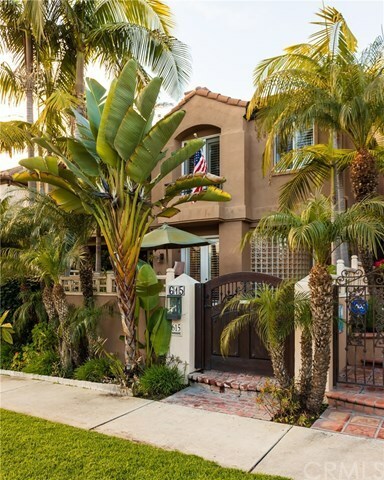 With a charming courtyard entry with ample room for seating, host and entertain guests with ease and enjoy the indoor/outdoor lifestyle of living by the ocean. With neutral color tones and coastal chic design, the main floor showcases an open concept living and dining room with double doors opening to the front patio. The spacious kitchen showcases bright white cabinets, granite counters, upgraded stainless appliances, and flows to a cozy family room with custom built-ins for storage and design. The house features ample windows illuminating the space with natural light, making it feel extra bright and airy. Upstairs boasts three bedrooms including two master suites and an added guest bedroom, all three with attached private bathrooms. Head up one more level to the rooftop deck to observe spectacular views of Southern Californiaâs incredible sunsets, local mountains and the Pacific Ocean. This over 2600 SF property features many upgrades including a two car attached garage. Ideally located at the quiet end of 22nd street, this house is close to Dwyer/Smith/HBHS, and an easy walk or bike ride to the beach, Downtown, and Pacific City. Directions: North on Goldenwest, Left on Palm, Right on 22nd Street, Right side of street.